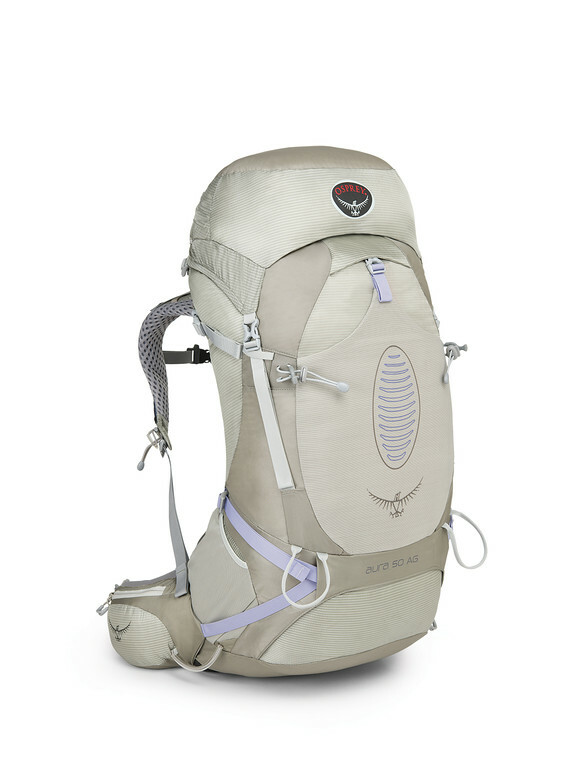 Featuring Osprey's Anti-Gravity suspension system, the women's-specific Osprey Aura AG 50 is designed to carry up to 40 pounds without you even noticing the load. It is the perfect companion on weekend or quick overnight trips. The secret to this award-winning pack is Osprey's clever Anti-Gravity suspension system?a seamless backpanel composed of lightweight mesh extending from the top of the backpanel to the hipbelt that contours to the body to deliver outstanding fit and unrestricted movement. The Fit-on-the-Fly hipbelt and easily adjustable torso length optimizes comfort on the trail. You can access your gear through the top of the pack or via a zippered front panel. The versatile floating top-lid is removable to shave weight but an integrated FlapJacket is always onboard to protect your gear from the elements. Final touches on this state-of-the-art pack include the Stow-on-the-Go? trekking pole attachment system, and ice axe loops for winter ascents. Anti-Gravity Suspension: The Atmos/Aura Anti-gravity backpanel is a continuous panel of lightweight mesh extending from the top of the backpanel to the hipbelt to provide unmatched comfort and ventilation. The seamless structure contours automatically to the body providing outstanding fit and unrestricted movement. Organization: An adjustable stretch mesh front panel pocket provides additional external storage and organizational options. Dual zippered front panel pockets allow additional internal storage and organizational options. Flapjacket: A removable floating lid can be replaced with a fixed FlatJacket to protect your packed gear and minimize weight. Anti-Gravity Suspension: Lightwire? tensioned, full peripheral frame comfortably transfers pack load. Anti-Gravity Backpanel: +Top to bottom suspended mesh wraps shoulders, back and hips for a fully integrated backpanel fit. 2868 in3 / 47 l | 28h x 14w x 13d in. | 4.01 lbs.